Does a wing in a potential flow have lift? In Landau - Lifshitz, Vol 6, §11 it is shown that the force vector on any object in a potential flow is zero (i.e. there is neither lift nor drag). The mathematics behind this derivation are above my understanding, thus I can't really follow how this is shown and what assumptions are made along the way. The Wikipedia article on the d'Alambert's paradox states that a body in a potential flow does not experience drag. On the other hand the article does not say anything about lift forces and the German version explicitly states that it does not apply for lift forces. A common explanation for the lift produced by wings seems to be that its asymmetric shape causes a higher velocity of the flow above the wing and a lower below. Due to Bernoulli's equation that would result in a pressure-difference and thus a force. Honestly I don't quite get this explanation as I don't see where the different velocities are supposed to come from (without friction and thus without the circulation resulting from turbulences behind the wing). So now I'm wondering, do or do not wings have lift in irrotational, inviscid, incompressible fluids. The first question you need to ask is: does an irrotational, inviscid, incompressible fluid really exist? The answer is no (well, yes, sort of, if you consider super-fluids). The irrotational, inviscid, incompressible fluid is a mathematical creation to make the solution of the governing equations simpler. Lift cannot exist without viscosity! That's is the most common misconception that comes from an undergraduate aerodynamics course. So it bears repeating. Lift cannot exist without viscosity. When we look at potential flow though, we get pressure differences and these pressure differences result in lift, so what gives? First, the potential equations don't actually hold until the starting vortex is sufficiently far away. The discussion of sufficiently far away is, again, a vague concept. But it involves determining the velocity induced on the wing by the starting vortex using Biot-Savart law. Essentially it is "far enough" away when the induced velocity is small relative to the other velocity magnitudes in the problem. Viscosity causes this starting vortex to appear and this starting vortex is what causes pressure differences. Additionally, in the absence of viscosity, circulation is conserved around a closed path. This is no problem if we make our domain large enough to include the starting vortex. However, we can't actually solve for the starting vortex with the assumptions made to get the potential equations, so we have to omit it from the domain. This means we need to have some sort of circulation within our domain and this is what becomes the bound vortex. At start up, viscosity causes the starting vortex to be shed and it proceeds downstream. Potential equations cannot deal with this situation because they lack the viscous term. It's just not something they can predict. However, in the free-stream the flow behaves as if it were inviscid. So once the starting problem is overlooked, this vortex will persist forever because nothing will dissipate it. If we take that solid outer line as a control surface, we can integrate around it and find that there is no circulation. So Lord Kelvin can rest easy. But, since this vortex lasts forever, it's not possible to track it forever or the solution to the problem becomes very expensive. And we are (usually) interested in the steady state solution (although unsteady potential solutions are also possible). So we make an artificial cut in our domain, that's the dashed line. When we make that cut, the integral of vorticity around the sum of the two smaller control surfaces must still be 0. 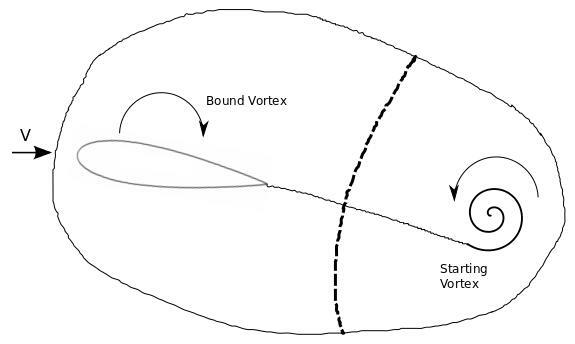 This means that the vortex bound to the airfoil has a circulation equal in magnitude and opposite in direction to that of the starting vortex. During this start up process, very large velocity gradients exist at the trailing edge. This is what causes that vortex to be shed. Once the vortex moves away, the velocity gradients become smaller and smaller, eventually reaching zero. This zero-gradient condition is handled automatically by viscosity, but it must be enforced in the potential equations through the Kutta Condition. we can enforce two boundary conditions because we have a second derivative in $u$. We typically set these to be $u_n = 0$ and $u_t = 0$, implying no flux through the surface and no velocity along the surface. Dropping the viscous term results in only having the first derivative in $u$ and so we can only enforce one boundary condition. Since flow through the body is impossible, we drop the requirement that tangential velocity be zero -- this results in the slip boundary condition. However, it is not physically correct to let this slip line persist downstream of the trailing edge. So, the Kutta condition is needed to force the velocities to match at the trailing edge, eliminating the discontinuous velocity jump downstream. ... in real life, the way that nature insures the that the flow will leave smoothly at the trailing edge, that is, the mechanism that nature uses to choose the flow... is that the viscous boundary layer remains attached all the way to the trailing edge. Nature enforces the Kutta condition by means of friction. If there were no boundary layer (i.e. no friction), there would be no physical mechanism in the real world to achieve the Kutta condition. He chooses to explain that nature found a way to enforce the Kutta condition. I prefer to think of it the other way around -- the Kutta condition is a mathematical construction we use to enforce nature in our mathematical approximation. The explanation of flow over the top needing to go faster to keep up with flow on the bottom is called the Principle of Equal Transit and it really is not a great way to present the problem. It is counter-intuitive, has no experimental validation, and really just leads to more questions than answers in most of the classes it is discussed. To sum all of this up and to directly answer your question: yes, wings do have lift in incompressible (and compressible), irrotational, inviscid flow. But only because the potential flow equations are a mathematical abstraction and the Kutta condition is a mathematical "trick" to recover a solution that generates lift under those conditions. Of course, not just any wing will have lift. A symmetrical wing at zero degrees angle of attack will not have lift. Lift of an airfoil does not arise from asymmetrical wing shape. It arises from the fact that the direction of the airflow is deflected. This deflection takes the form of a vorticity about the wing, but that is not inconsistent with potential flow. This article shows clearly how a vortex can be irrotational. This picture in the Wikipedia article on potential flow illustrates a wing generating lift in a potential flow. Here is the best, most scientific, most accessible discussion I have yet seen explaining how wings work. Enjoy! Solving potential flow around an airfoil without Joukovsky-Kutta condition should allways result in zero-circulation.If we just take J.K. condition in account,solution is different; we implicitly included viscosity in the problem and circulation is not necessarily zero,even there is no viscosity term! Not the answer you're looking for? 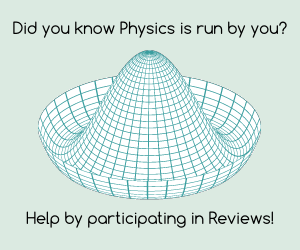 Browse other questions tagged fluid-dynamics aerodynamics lift or ask your own question. What is a Physically Accurate Explanation for the Kutta Condition? When is a flow vortex free? By what mechanism is lift produced on a rotating cylinder in an inviscid flow? How does Bernoulli's principle produce wing lift? Are the hypotheses of the Bernoulli equation satisfied for a bird or airplane wing at low Mach number? What does a wing do that an engine can't? What's wrong with this argument that aerodynamic lift really does rely on Bernoulli? What causes angular deformation in an inviscid free vortex? How does the lift force of an airplane work?